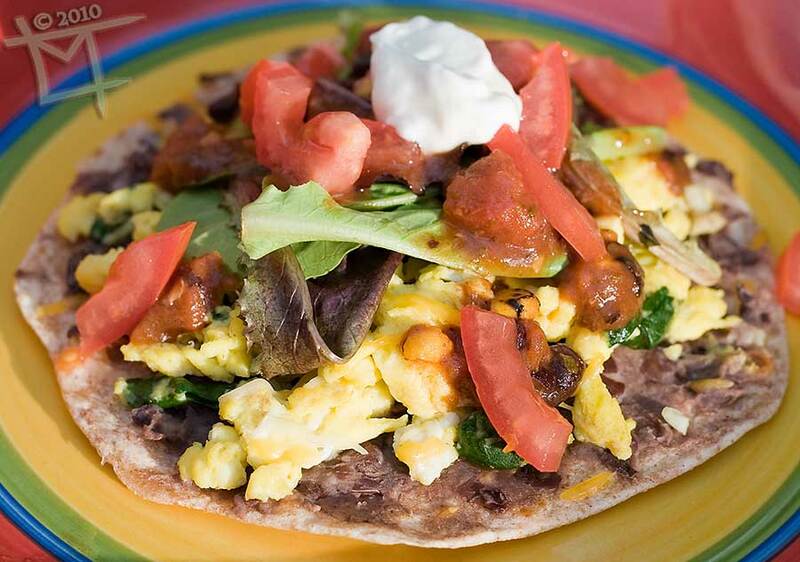 I mentioned our Soft Shell Breakfast Tostada made with homemade tortillas in last weeks bread challenge report. We enjoyed these so much that we made them again for a dinner lest than a week later. The second time around I played around with the tortilla recipe a bit and did half wheat flour and half white flour. I think I am hooked on fresh tortillas. They are so. much. better. than store bought tortillas and pretty simple to make. We are even more happy with the 1/2 and 1/2 version of tortillas this time than the plain white flour tortillas I made the first time around. I plan to keep playing with the recipe and upping the while wheat flour. We do breakfast for dinner pretty much on a weekly basis and I think I could make these breakfast tostadas weekly. They are quick, easy and tasty. They would be fun for a themed breakfast or brunch gathering as well as dinner and can be changed to fit what you have in your pantry. Smash and warm black beans over medium heat. While beans warm beat together eggs and milk and then scramble to your desired consistency. While the broiler warms for a few minutes lay tortillas out on a large cookie sheet. Spread about 2 tablespoons of black beans over each tortilla. Divide scrambled eggs between eacg tortilla. Spread the eggs evenly. Sprinkle about 1 tablespoon cheddar cheese over each tortilla.Place the pan of tostadas in the oven on a middle rack for 1-2 minutes or until the cheese is just melted. Top each tostada with 1 tablespoon salsa, diced roma, lettuce and sour cream. Serve immediately. Yum! I love breakfast for dinner.